Boosting your Qi or life force energy is often one of the aims of acupuncture and herbal treatment. However, there are things you can do on your own everyday to build your Qi! 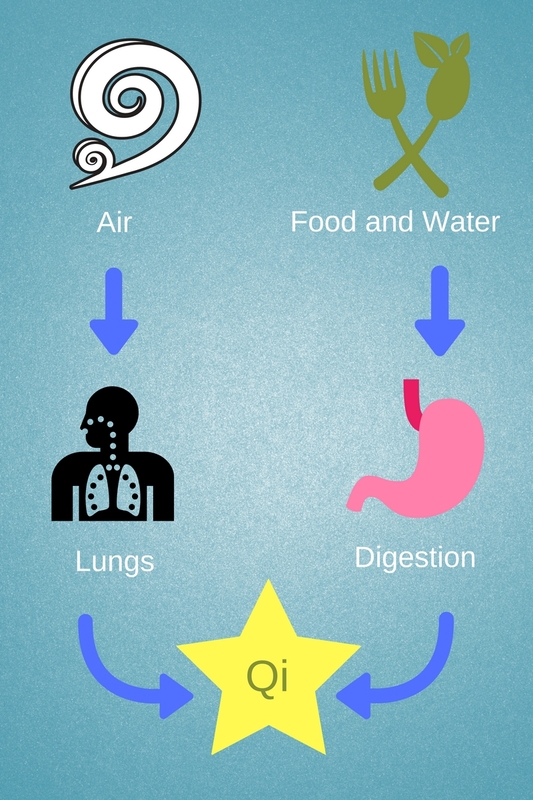 The food you eat and the water you drink are broken down by your digestive system. The nutritious parts of your food come together with the air you breathe and Qi or energy is made. You are constantly bringing your immediate environment into your body this way. Literally, the air you breathe in your home, your car, your office becomes what you are made up of. Similarly, the water you drink, where it comes from and what is in it becomes what you are made up of. And the food you eat, what’s in it, what’s on it, where it comes from, how long ago it was picked, all provides information about your environment to your body. This is how your genes are turned on or off by your environment, what’s called epigenetics. Now consider the current state of affairs. We process the nutrients and life force out of our foods. We ship them around the globe, losing nutrition and the essential information that comes from our local foods, about how to adapt to our surroundings. Our water is full of hormone disruptors from plastics and medications, then we send it through a processing plant, adding chlorine and fluoride that disrupt our thyroid health and send it through metal pipes to our homes. The air in our homes and workplaces is polluted with off gassing of things like plastics and cleaning products. Our bodies are overwhelmed with just trying to stay ahead of disease! Our adaptation to this polluted environment is dysfunctional. At best, we are tired, stressed, foggy brained and suffer digestive or skin issues. In Chinese medicine we call this Qi deficiency. Our bodies can’t make enough Qi or energy from the raw materials we are giving it. We can’t make strong Qi from low quality resources. If you have insufficient life force, you may experience difficulty getting pregnant. Your body’s survival mechanisms will always choose survival over reproduction. There just isn’t enough life-force to share around. Bump up the quality of the raw materials you are providing your body to make Qi. The air is better outside, open a window or go for a walk. Go for a walk in the forest for extra credit. Choose unprocessed, whole foods and cook them yourself. Go organic where you can. Get them from your local farmer for extra credit. Filter your tap water. Reverse osmosis is best for city water. Get local spring water in a glass bottle for extra credit. Of course this is simplified and not every infertility situation is reflected in the body’s production of energy. This is just to underline how foundational the things you do everyday are to your health. They are profoundly significant. Even when you can’t see it, these efforts make a difference. « Your Period is Not Supposed to be a Pain!